As Jeff Weber travels around San Antonio, Texas, educating more people about the benefits and mechanisms of the Automated Investing Method (AIM), he often meets people with people who wonder how they can help their children have a more secure and prosperous future. This is a very real and valid concern in our world today. It is also a concern of many readers of INFLUENCE magazine which has a large distribution in the greater San Antonio metro region. 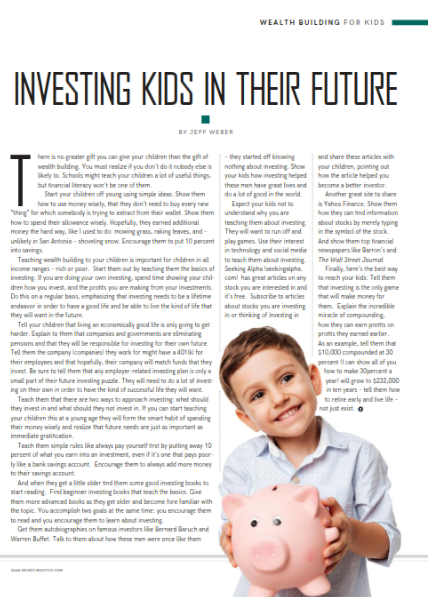 To read the rest of Jeff’s article in the July-August 2018 edition of INFLUENCE Magazine, click INVESTING KIDS IN THEIR FUTURE or click the image below. Advance to Page 17 of the digital issue to read Jeff’s article. If you want an investing method that automatically buys low, sells high, and earns systematic profits from the ups and downs in the stock market, learn how Jeff Weber has applied the AIM system. You can pick from one of the options on this page for a free introduction to his expertise. Our thanks to Cedric and the team at San Antonio’s INFLUENCE magazine for the opportunity to promote the importance of financial literacy and smart investing.